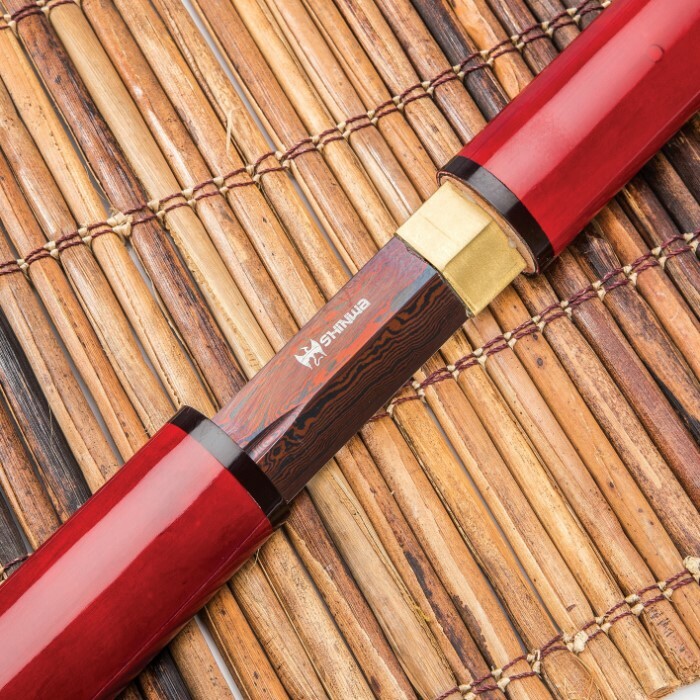 Shinwa’s sleek, eye-catching “ScarletFang” Shirasaya Sword undeniably stands apart from the rest and is a must-have for any serious sword collector. Amongst even the finest, most ornate katana, wakizashi and other common Japanese sword styles, this alluringly clean, no-frills sword is an immediate standout, sure to draw attention and spark lively conversation. 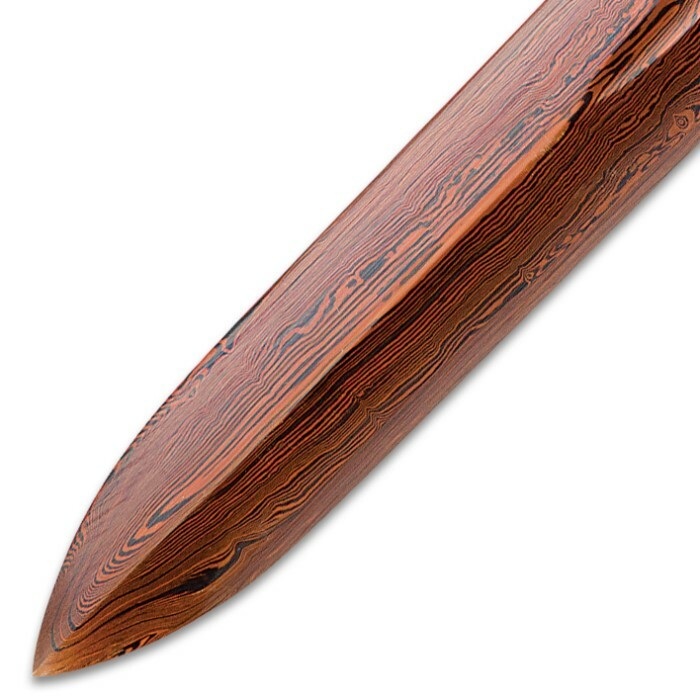 The traditional shirasaya configuration’s satiny smooth lines, unique staff-like shape and hand-lacquered hardwood construction all make for a beautiful example of Japanese swordcraft’s diverse design variety and vast aesthetic range. Though its roots stretch back centuries, for most, the shirasaya represents a fresh, intriguing departure from the katana-like image ingrained in the popular imagination: ray skin and cord-wrapped tsuka, ornate guard, sageo accented saya and the like. But, interesting and alluring as the fluid, polished exterior may be, don’t forget – this sword is equal parts “silk” and “fang.” As such, the “silky” smooth saya conceals a potent pair of “fangs” – two carefully honed edges on a menacing black Damascus steel blade. The ScarletFang’s distinctive black Damascus steel blade is a tumultuous sea of contrasting lines, waves, swirls and other mesmerizing patterns, all cloaked in a shadowy dark hue. Each line is a distinct variety of steel, hammer welded and hand folded repeatedly to yield the thousands of layers in each ScarletFang blade. The unique metalsmithing technique’s roots stretch back to the Middle Ages, and today it’s still painstakingly performed by seasoned hands – no automation, no mechanization. To make each ScarletFang blade, a Shinwa master swordsmith fires a stack of steel blanks - each piece a different alloy - in a white-hot forge until the metal glows red hot. He then removes the stack and hammers it until it’s around half as thick as the original. Then he folds the metal onto itself lengthwise and hammers each half together. The process is meticulously repeated – hundreds of times in some cases – until the desired layering effect is achieved, at which point a final quenching strengthens the resulting blade, while an acid treatment highlights vivid contrasts in the layers. And the slow, laborious process itself it just the beginning! In order to achieve sufficiently dramatic contrasts, Shinwa’s master smiths must expertly select an appropriate combination of steel alloys of varying color, luminescence and other visual qualities. For the sake of strength, resilience and countless additional blade factors, the smiths must also must consider each alloy’s distinct melting point, proper stacking order, forge temperature and myriad other variables. 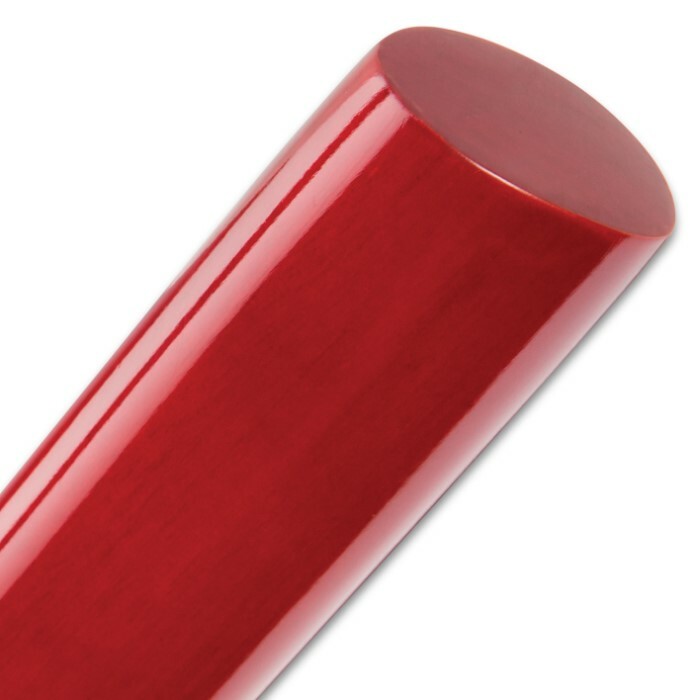 Simply put, an unbelievable quantity of blood, sweat and tears goes into every ScarletFang blade. As if that weren’t enough, Shinwa adds its own innovative modern twist to the ScarletFang blade - an exclusive, closely guarded secret process that imparts its brooding dark hue; putting the “black” in black Damascus, so to speak. Rich amber lines swirl over a deep black void like trails of blood flowing down a blackwater river. It's Damascus steel...after dark. And of all the world’s swords, Shinwa’s ScarletFang is one of a relative few to feature it. Furthermore, like a steel snowflake or fingerprint, the patterning on no two ScarletFang blades is exactly alike. Uniqueness is becoming an ever-scarcer quality in today’s sword industry. Every sword maker tries to outdo the rest with intricate, over-the-top ornamentation accented with rare, precious materials like abalone or ebony. In a marketplace crowded with gaudy, expensively swords adorned in showy, ultrapremium finery, how does any modern sword collector keep up? What sword will truly embolden any collection or display with a genuine sense of originality and fresh appeal without costing a small fortune? The seemingly paradoxical answer: trade flashy, over-the-top frills for clean, simple form. 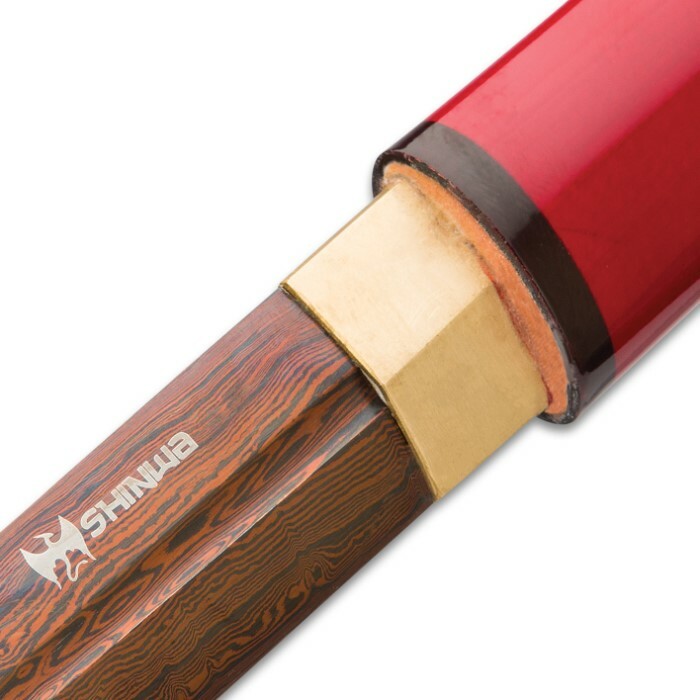 Shinwa’s ScarletFang Shirasaya is the simple standout that comes fully loaded - with value, sleek minimalist style, real-world effectiveness and genuine handcrafted substance. Pros: Comes in an attractive, fabric-wrapped sword box with a silk lined (I think) sword bag inside. Blade weight/thickness is just the right balance between power and speed. Has two very decent edges out of the box, as well as a wicked point. The black Damascus blade is absolutely beautiful, and complements the red lacquer saya and tsuka perfectly. Saya and tsuka are shiny, smooth and in the same line, making this sword look sleek and generally awesome no matter how you use or display it. I haven't done too much with it because it's so pretty, but it cuts through tin cans and bottles of all types like they're not even there and could definitely take care of business if you needed it. Cons: Has a "Handcrafted in China" stamped near the base of the blade, which is a little annoying. At least on mine, the sword can only be sheathed with the blade facing one way, or the edge of the saya will be slightly off-true with the handle. I guess the mouth of the saya is a little unevenly carved. The inside of the sheath has a tendency to get wood shavings on the blade when you draw it, but that got better with time. Overall, the Scarlet Fang is a gorgeous weapon that will do equally well cutting or hanging on your wall, and getting it for $70 is straight up robbery. Really nice steel. Great finish on the forge welded Damascus, and the red lacquer on the wood is smooth and flawless. 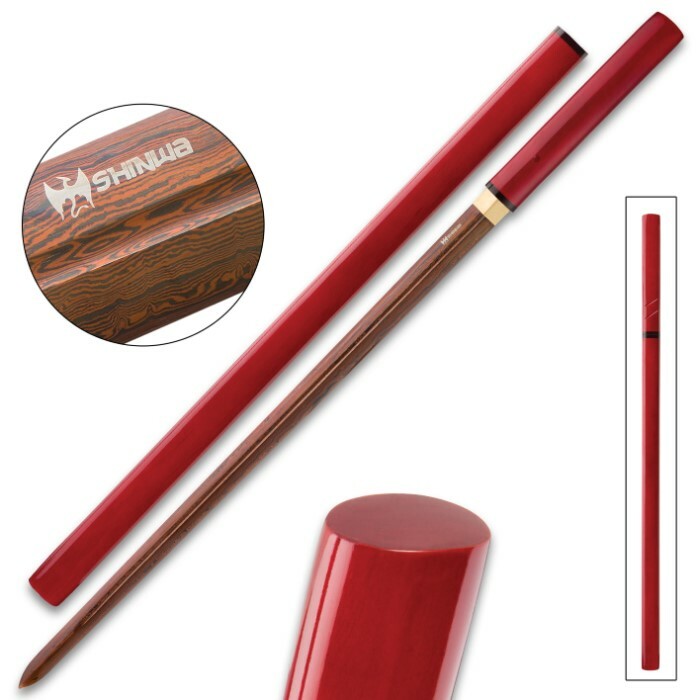 The Shinwa logo is printed on the blade near the handle, that's fine, but "made in China" is printed right underneath. I would like to polish the printing off, however I don't want to remove the black Damascus acid finish. Just got my sword, will have to say I was doubtful at first, after reading comments about other scarletfangs. After opening the box I was surprised. 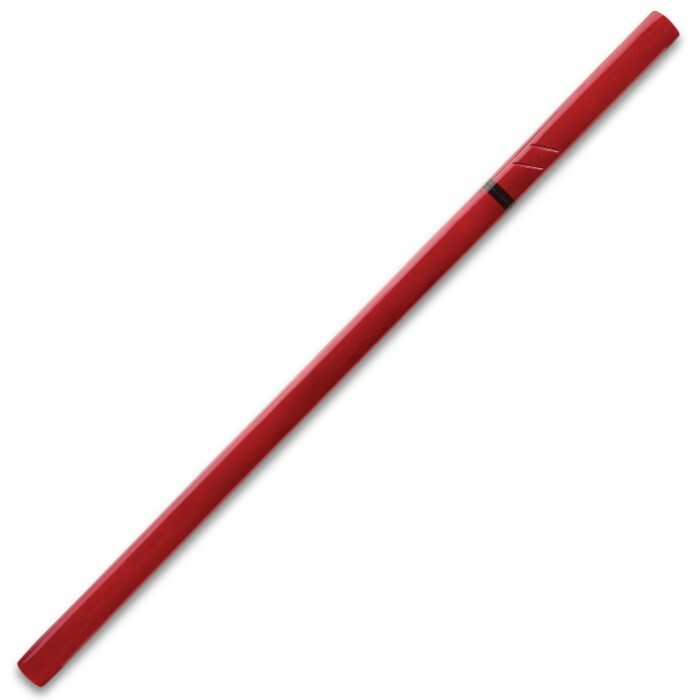 The sword came in a red box embellished with dragons and was two tone red it might be silk, with two latches. The sword was in a black cotton sleeve with a tie at the top. Once I removed the sword, low and behold, it has a nice red lacquered finish wit no dings or scratches. After pulled the sword from its saya, I was even more pleased the blade was not bent or chipped just a little dirty. Am waiting now for the cleaning kit to come in. I will be ordering from true swords again. Shinwa Black Damascus Red Samurai Shirasaya Sword. I was skeptical at first but when I pulled the sword out of the box, I fell in love with it. It's just what I was expecting for the price. The blade was really dirty when I pulled it out of the box, I will clean the blade and oil it tomorrow. I was some what disappointed with the sharpness of the blade but that can be taken care of also......For the price you can't go wrong! This sword is an awesome buy & in the hands of a swordsman , it is most definitely a MANKILLER!! As one who has again "picked up the sword", I am fully prepared to Kill if necessary. The quality of the blade is a tribute to Swordmaking!! And it is because of this quality, I have been inspired to buy more of the Shinwa Swords. For starters for the money you absolutely cant go wrong... 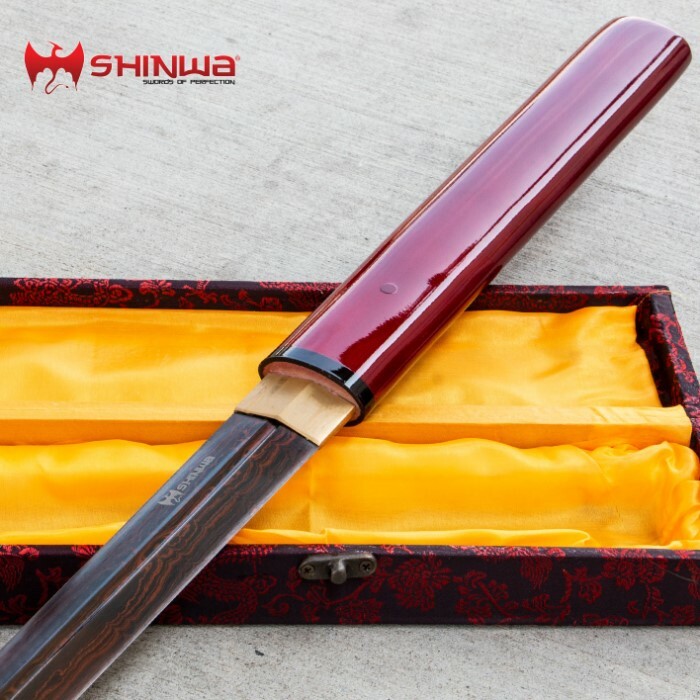 It is a very very nice sword, it has a solid feeling and well finished... Theres no rattles or bad gaps, And the Handle and saya finish is deep and glossy and is flawless I'm very surprised and impressed with the craftmanship of this piece. I really was not expecting it to be of this level of quality for the price i expected it to be just decent not great. There is one big problem and that is it is so beautiful i dont want to use it! So its going on the sword rack on display next to my Hanwei and Ronin and others, its defiantly worthy of hanging next to swords of much higher prices. Did i mention its drop dead beautiful! Sword arrived in a crushed sword box, NOT FROM SHIPPING as the shipping box was fine. The red sword box was crushed BEFORE it was shipped. Result was a fingernail size chunk of the handle missing and several marks throughout the entire sword. Other than that it was sharp enough and fit scabbard OK. Sad how someone would ship a very visibly damaged container with ZERO consideration for the costumer. Not worth the effort and cost of returning. I have bought ALOT from BudK but this was the worst experience.